This is the area for Fully Automated Dissolution Testing systems. 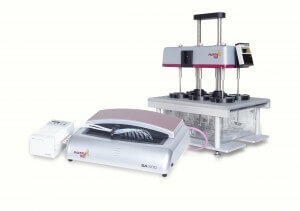 An entirely new generation of automated dissolution systems is the IDS 1000 and the DTS 800. The fully automated Fibre Optic IDS 1000 In-Situ-Dissolution Test system incorporates a UV Diode-Array Detector, a 9-channel multiplexer and holds up to 8 fibre dip probes which measure straight inside the media. Fast sampling sequences, a full spectra scan is available for all connected vessels in less than 30 seconds, immediate result display, minimum change over time from test to test are some of the advantages offered by the IDS 1000. The DTS 800 is a “conventional” fully automated dissolution test system which incorporates a built-in UV/VIS Diode-Array Detector, a built-in 8 channel Peristaltic Pump and a built-in 8-cell Changer. Due to the “all-in-1” design tubing is short, measuring time is fast and bench space saving is enormous, just 100 cm. This is valid for the IDS 1000, too. The IDS 1000 and DTS 800 systems are driven by the WinDiss32 Dissolution software package. Most people describe fully automated as having the instrument do everything (take measurements, samples and calculate results and so on). They add the tablets themselves when prompted to do so from the screen and are always filling and cleaning the vessels themselves. Automated Dissolution Testing in this case does mean sampling, measuring, and result calculation are automated. “Conventional” Automated On line and Off line Dissolution Systems are also available as you can see on this and previous pages. An On Line system ADS is usualy understood as a “closed loop” dissolution system. 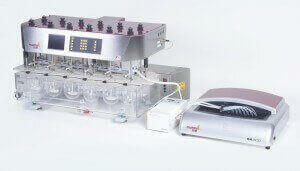 This incorporates a Dissolution Bath a suitable Pump and an UV/VIS Spectrophotometer with a Multi-Cell Changer. An Off Line system includes a Fraction Collector or an Auto Sampler which will collect the sampled dissolution media and offer for example Dilution (DSR/ASP200) as well as direct injection of the prepared sample into either an UV/VIS Spectrophotometer or a HPLC System. IDS1000 or Fibre Optic In situ Dissolution System is about the application of direct measurement technology to Dissolution Testing. Traditionally, dissolution testing has been carried out on solid dosage forms using a standard dissolution test apparatus. Samples of the dissolving active within the dosage form are taken for estimation from the dissolution tester either manually, or using more automated means such as a pump which has been connected to a suitable measurement device, usually a UV-VIS Spectrophotometer. Using the IDS1000 and the WinDiss32 Dissolution Software, not only can the whole process of sample measurement be automated, but can also be self contained, such that there is no need for samples to be pumped out of the dissolution vessels to external measurement facilities such as a Spectrometer, because all that is needed for the measurements to be made is contained within the confines of the instrument itself. The system control functions are provided by the WinDiss32 Dissolution Software a fully 21 CFR part 11 (GAMP) compliant software package suitable for in-situ, closed loop and off-line system operation. The DTS800 “Al-in-One” closed loop Dissolution Test System is designed for the fully automated determination of dissolution rate of active materials in tablets and other solid dosage forms in one compact, totally integrated design. 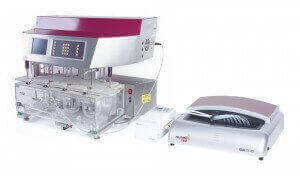 The system contains a 8 vessel dissolution tester and a built-in Diode Array UV/VIS spectrophotometer as well as a built-in 8 channel pump and integrated 8 way, flow through, sample cell changer which can handle flow-cells up to 20 mm path length. The system control functions are provided by the WinDiss32 Dissolution Software a fully 21 CFR part 11 (GAMP) compliant software package suitable for closed and open system operation. As all components in the standard version are integrated in the same housing, sample transfer tubing is kept to a minimum and is designed for easy replacement. All connections are “lockable” Luer types for easy and secure connections. 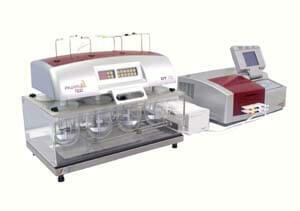 The system conforms to the current Pharmacopoeia requirements (USP <711/724> / EP <2.9.3/4>) for such a test system. PTWS310, manual or automated Tablet Drop Magazine, EPE Auto Sampling Manifold, PTFE tubing installation, Peristaltic or Piston Pump, ASP2000 Sample Processing System, Agilent HP 1100 HPLC Pump and Multiple Wavelength Detector, the full system is controlled by the WinDiss32-V3 software (21CFR part 11 compliant) and a control PC system. The perception of automation in dissolution testing differs greatly from user to user. The most labour intensive stage is taking samples at the specified time periods as found in the company SOP (Standard Operating Procedure). This involves the taking of 6 samples according to the USP and most other Pharmacopoeia, there is often a requirement for a staggered start in most cases so that accurately timed sampling may be achieved. At this point the operator must also consider either to remove samples manually and replacing the collected samples volumes in the dissolution vessels or use an automated system. A typical automated dissolution system ADS100 is composed of: a 6 vessel dissolution bath type PTWS100 including in-situ sampling probes which are placed into the vessel covers, tubing installation in Teflon , Peristaltic or valve-less Piston Pump, T70 UV/VIS split-beam spectrophotometer or any other UV/VIS Photometer such as the SA500 Diode Array Spectrophotometer and the built-in Multi-Cell Changer (6 or 8 cells), WinDiss32 Dissolution (fully 21CFR part 11 & GAMP compliant) software and a control PC system. The perception of automation in dissolution testing differs greatly from user to user. The most labour intensive stage is taking samples at the specified time periods as found in the company SOP (Standard Operating Procedure). This involves the taking of 6 to 8 samples according to the USP/EP and most other Pharmacopoeia. A closed loop dissolution test system does not require staggered stirrer start as all samples are removed simultaneously. Media refilling is not required using a closed loop system as there is no media loss at all. The WinDiss32 software can be applied on-line to allow the control a PTWS100 Dissolution Bath which is equipped with 6 dissolution vessels, also of a peristaltic-, piston-, or syringe pump as well as a UV/VIS spectrophotometer (single beam, double beam, diode array of various popular models) with a multi-cuvette changer. In the case of using an 8-cell changer, cell position 7 is reserved for the blank and cell position 8 for the 100% dissolved active solution which can be placed in closedglass beakers outside the PTWS100. Calculations are made based relative to the maximum absorbance or a theoretical maximum absorbance for 100% dissolved active. Options also exist for concentration calculation based on a standard curve or a “mg/Abs. Unit” profile which the user can enter. The WinDiss32 software is 21CFR part 11 compliant and installed at a control PC system using Windows 2000, XP or NT-4TM . Using the state of the art Dissolution Software WinDiss32 the PTWS100 is connected to a suitable UV/VIS Spectrophotometer with multiple cell changer. For more information please ask to get the demo software pack. WinDiss32 includes different photometer, auto sampler and pump drivers. If you have preferred requirements please ask for more information. A typical automated dissolution system ADS310 is composed of: a 8 vessel dissolution bath type PTWS310, EPE auto sampling system, Tablet Drop Magazine with incorporated evaporation proof vessel cover design, ITM Individual Temperature Monitoring System, PTFE tubing installation, Peristaltic or valve-less Piston Pump, UV/VIS T70 split-beam spectrophotometer or any other suitable UV/VIS spectrophotometer like the SA 500 Diode Array Spectrophotometer with an integrated Multi-Cell Changer (6, 8 or 16 cells), WinDiss32 software (fully 21CFR part 11 & GAMP compliant) software and a control PC system. The WinDiss32 software can be applied on-line to allow the control a PTWS310 Dissolution Bath which is equipped with a Manual Tablet Drop Magazine, the EPE and ITM (option), also of a peristaltic-, piston-, or syringe pump as well as a UV/VIS spectrophotometer (single beam, double beam, diode array of various popular models) with a multi-cuvette changer. In the case of using an 8-cell changer, cell position 7 is reserved for the blank and cell position 8 for the 100% dissolved active solution. Calculations are made based relative to the maximum absorbance from vessel 8 (standard) or a theoretical maximum absorbance for 100% dissolved active. Options also exist for concentration calculation based on a standard curve or a “mg/Abs. Unit” profile which the user can enter. The WinDiss32 software is 21CFR part 11 compliant and installed at a control PC system using Windows 2000, XP or NT-4TM. Using the state of the art Dissolution Software WinDiss32 the PTWS 310 is connected to either a SA 500 Diode-Array, an Agilent 8453 or any other suitable UV/VIS Spectrophotometer. For more information please ask to get the demo software pack. WinDiss32 includes different photometer, auto sampler and pump drivers. If you have preferred requirements please ask for information. 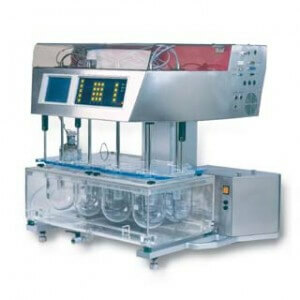 A typical automated dissolution system ADS610 is composed of: a 8 vessel dissolution bath type PTWS610, EPE auto sampling system, Tablet Drop Magazine with incorporated evaporation proof vessel cover design, ITM Individual Temperature Monitoring System, PTFE tubing installation, Peristaltic or Piston Pump, a T70 UV/VIS split-beam spectrophotometer or any other suitable UV/VIS spectrophotometer such as the SA 500 Diode Array Spectrophotometer with a built-in Multi-Cell Changer (6, 8 or 16 cells), WinDiss32 (fully 21CFR part 11 & GAMP compliant) software and a control PC system. The WinDiss32 software can be applied on-line to allow the control a PTWS610 Dissolution Bath which is equipped with a Manual Tablet Drop Magazine, the EPE and ITM (option), also of a peristaltic-, piston-, or syringe pump as well as a UV/VIS spectrophotometer (single beam, double beam, diode array of various popular models) with a multi-cuvette changer. In the case of using an 8-cell changer, cell position 7 is reserved for the blank and cell position 8 for the 100% dissolved active solution. Calculations are made based relative to the maximum absorbance from vessel 8 (standard) or a theoretical maximum absorbance for 100% dissolved active. Options also exist for concentration calculation based on a standard curve or a “mg/Abs. Unit” profile which the user can enter. The WinDiss32 software is 21CFR part 11 compliant and installed at a control PC system using Windows 2000, XP or NT-4TM. Using the state of the art Dissolution Software WinDiss32 the PTWS610 is connected to either a SA 500 Diode-Array, an Agilent 8453 or any other suitable UV/VIS Spectrophotometer. For more information please ask to get the demo software pack. Automation of a 12 station Dissolution bath is different to common 6 vessel system. 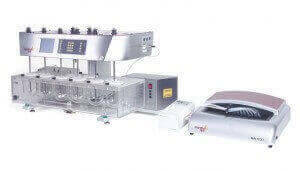 This system ADS1210 is composed of: a 12 vessel PTWS1210 dissolution bath, EPE auto sampling system, manual or automated Tablet Drop Magazine, tubing installation in PTFE (P), 16 channel Peristaltic Pump, UV/VIS Diode Array or other suitable Spectrophotometer and multi-cell changer (12 to 16 cells), the WinDiss32 software (fully 21CFR part 11 compliant) and a control PC system. The perception of automation in dissolution testing differs greatly from user to user. The most labour intensive stage is taking samples at the specified time periods as found in the company SOP (Standard Operating Procedure). This involves the taking of 12 samples simultaniously according to the USP/EP and most other Pharmacopoeia. The samples are pumped within a “closed loop” for some time. For the measurement the pump is stopped and the cell changer moves from position 1 to 12. The WinDiss32 software can be applied on-line to allow the control a PTWS1210 Dissolution Bath which may be equipped with the EPE auto sampling system, also of a peristaltic-, syringe-, or piston pump as well as a spectrophotometer (like the DAD SA500 which has 16 cell positions) with a multi-cuvette changer. In this case, position 13 is reserved for the blank and position 14 for the 100% dissolved active solution. Calculations are made based relative to the maximum absorbance from vessel 14 (standard) or a theoretical maximum absorbance for 100% dissolved active. Options also exist for concentration calculation based on a standard curve or a “mg/Abs. Unit” profile which the user can enter. The WinDiss32 software is 21CFR part 11 compliant and installed at a control PC system using Windows 00, XP or NTTM. 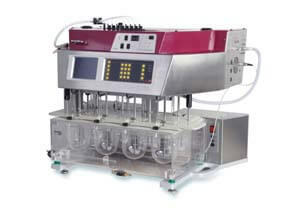 A typical automated dissolution system ADS70 is composed of: a PT-DT70 Dissolution Bath, flip back design, including 7 stirred vessels, tubing installation in PTFE (P) including in-situ sampling tubes with filter attached to each one, Peristaltic-, Syringe-, or Piston Pump, UV/VIS monochromator or Diode Array Spectrophotometer and multi-cell changer (6-8 cells), WinDiss32 software (fully 21CFR part 11 compliant) and a control PC system. The perception of automation in dissolution testing differs greatly from user to user. The most labour intensive stage is taking samples at the specified time periods as found in the company SOP (Standard Operating Procedure). This involves the taking of 6 samples according to the USP/EP and most other Pharmacopoeia. Using a closed-loop automated dissolution test system a simultaneous stirrer start after dropping all tablets is possible, also there is no volume loss at all during the complete test run. The WinDiss32 software can be applied on-line to allow the control of the PT-DT70 a peristaltic-, syringe-, or piston pump as well as a spectrophotometer (like the SA500 UV/VIS Diode Array or T70 UV/VIS Split-Beam and various other popular models) with a multi-cuvette changer. If 8 cell are available cell position 7 is reserved for the Blank or for the 100% dissolved active solution (Standard) while cell 8 can hold a reference standard solution. Calculations are made based relative to the maximum absorbance from an external 8th. (Standard) or a theoretical maximum absorbance for 100% dissolved active. Options also exist for concentration calculation based on a standard curve or a “mg/Abs. Unit” profile which the user can enter. The ASP2000 Hybrid Dissolution System with the PTWS310 and WinDiss32 Software introduces a new level of sophistication in Tablet Dissolution that allows simultaneous Collection, Dilution and Reagent Addition with subsequent injection for UV or HPLC analysis in real time. Also shown below is the optional SA 500 Diode Array Spectrometer with 16 cell changer. Most operations are performed with a Dissolution Bath integrated into the system. However, the AUTO SAMPLER ASP-2000 and sample preparation features can be used to process samples collected by other means, i.e., samples that are manually collected or collected by a conventional Fraction Collector such as the PTFC-2 etc. The ASP2000 utilises two probes; a Multiple Probe consisting of up to 8 Needles which can be used for sampling and a Single Needle Probe can be used for Dilution and or Injection. The ASP2000 can also handle 2 individual dissolution baths or a PTWS1210 system. This popular configuration is elaborate, but allows also calculation of results if samples are injected into a connected UV/VIS spectrophotometer using the new fully 21 CFR Part 11 compliant WinDiss32 software and is by definition PC controlled.